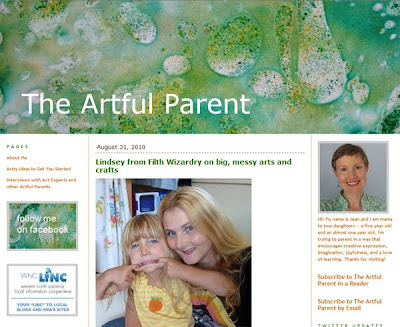 Interview at The Artful Parent. Jean who authors "The Artful Parent" asked me if I'd do an interview with her! She's been running a series of really interesting interviews with a lot of cool people that are involved with arts and crafts for children. I've been reading them all, so I was very flattered when she asked me to share some background on Filth Wizardry over there. You can check out our interview here. 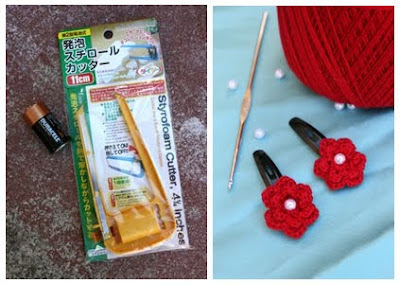 I'm giving away a Daiso styrofoam cutter and some little hair clips that I crochetted over there (pictured below), so if you want your name in the draw for them then you have to go over and comment on my interview post on The Artful Parent by Friday. Also, if you want to explore more interviews that Jean has done, then she has a list of them here. Lisa, who is a teacher, and blogs over at "K is for Kindergarten", made our Duplo letter blocks for her class here. I just sent my daughter into school with ours for her class to play with too! Christie from "Childhood 101" had a go at our giant stained glass window, but made it much less messy by using a large sheet of contact paper, here. 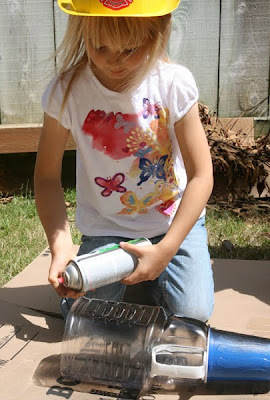 Marylea over at "Pink and Green Mama" made a lovely version of our land of Oz with her girls. They painted a nice board for it all, rather than the playdough road we made, and their lion looks much less freaky too ;). You can see it all here. 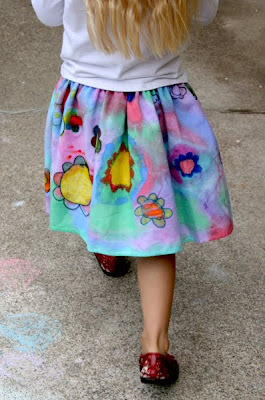 The painted skirt post got a lot of people trying it out and blogging about it. This one is beautiful! and this one too! A nice variation on it was done by Eden over at Eden Art, who let her daughter decorate a stained white princess dress with the same technique. Totally gorgeously rainbowy! Eden also had some fun with the Squidlies we posted about a while back and added some other shaped pasta to the hotdog-spaghetti mix, here. 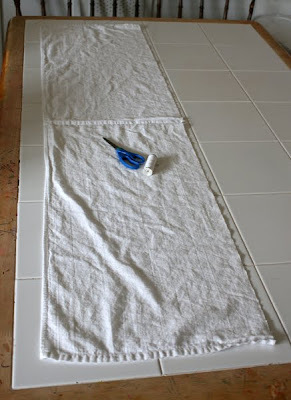 Over at Mom's Crafty Place, they made a lovely version of the shower curtain village play mat from a while ago, here. I have more reader's versions of our projects to share with you, and I'll do that on Thursday, when I'll have another project ready to show you too. 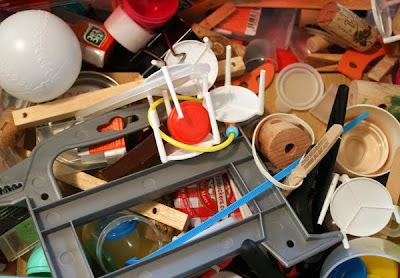 Lately the kids have been having plenty of fun just gluing together stuff from our collection of recycling. 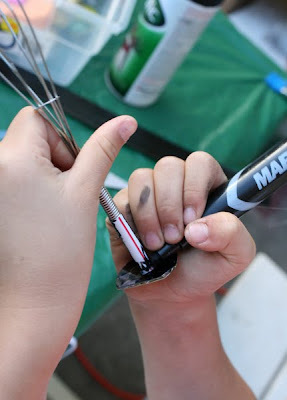 We've always done a fair bit of hot glue with junk from our recycling bin, but for some reason recently that has been a top priority for them both. 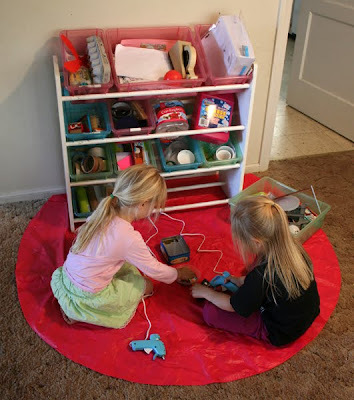 I put down a plastic table cloth by our storage rack of recyclables so that they didn't have to sit up at the kitchen table to use the glue guns. 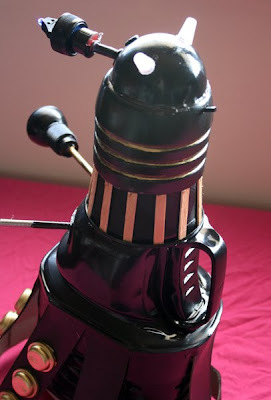 One of the robots that my five year old came to show me looked remarkably like a Dalek in shape. She'd glued a cup on top of an ocean spray juice bottle. 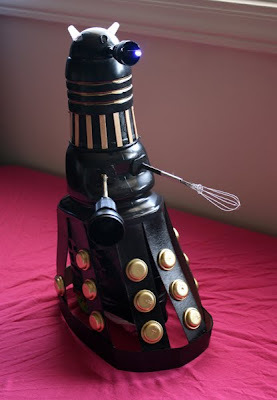 I said "Oooh, lovely, that looks like a Dalek", knowing that her next question was going to be "what's a Dalek?" We haven't let the kids watch Dr Who yet. I think they could handle a few of the ancient Sylvester McCoy ones (how badly did I want to be Ace when I was a kid! ), but the recent series are a lot more scary. I love Dr Who and remember hiding nervously behind furniture to watch the scary bits as a kid, but the last three Doctors have had some episodes that have freaked me out even as a grown up. Ones like Ecclestons's "Empty Child" and Tennant's "Blink" had me almost hiding behind the sofa nearly 20 years later! I do want to find some of the older series that the kids can watch though. If you grew up in the UK during the 70s or 80s then Dr Who is just part of your cultural heritage. 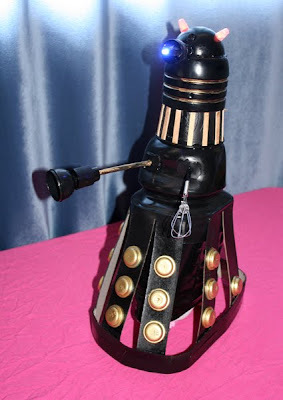 Your mum will have called you for dinner at some point, only to find you holding a sink plunger in one hand, an egg whisk in the other, with a collinder on your head, yelling "Exterminate!" at the top of your lungs. That's healthy right? Anyway, I showed her a few clips of Daleks and talked about Dr Who and she wanted to make her dalek move around like the ones she saw in the clips. 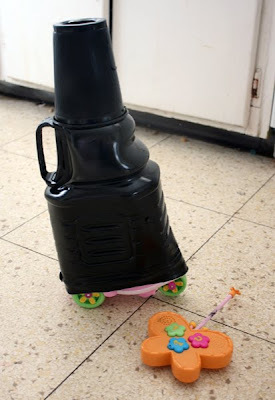 I figured the easiest way to do this was to just cut the bottom off the juice bottle and use some electrical tape to stick it on top of the only RC toy we have, which is a My Little Pony scooter. 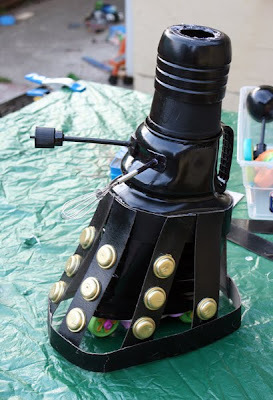 We found a bunch of stuff in the recycling stash that looked suitable to decorate the dalek with and went outside to spray it with some black and gold plastic spray paint that we had left over from other projects. The hemispheres on the dalek base were made from the bottoms of little plastic quarter machine toy containers we have saved. We didn't have quite enough to do the rows of four all around, but enough to get the idea. 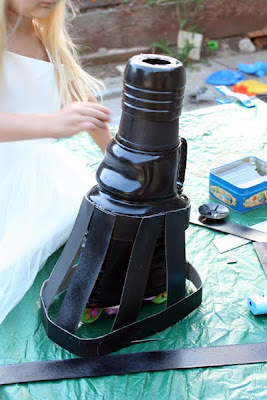 The blaster gun was an ode to the standard kid dalek dress up attire. 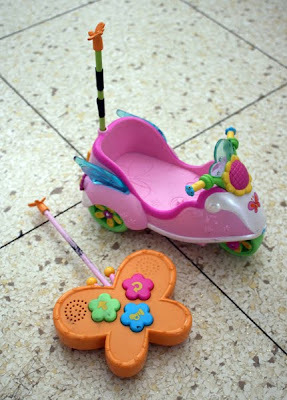 We used a toy egg whisk from the kid's kitchen play set. 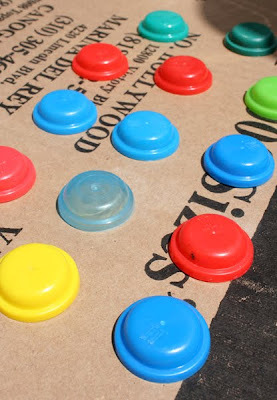 The eye stick was a sports drink cap stuck on a stick of hot glue. 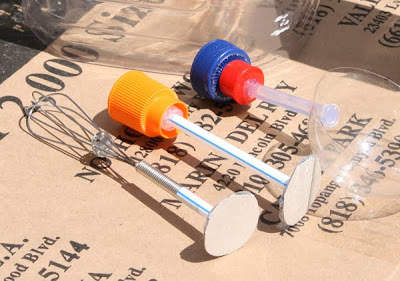 The "manipulator arm" was a drinking straw with the spray top and tube from a hair detangling spray and then the round cup end from a plastic easter egg glued on. 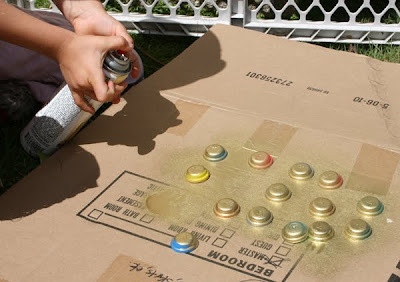 The kids had fun spraying the paint on. 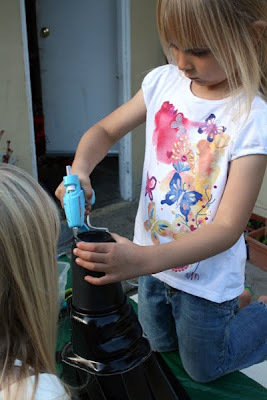 I think it's quite cute that my five year old had to use her thumb to get the required pressure for the paint to spray out, and my four year old had to use both thumbs. Awww. After all the bits were dry, I taped the body onto the RC scooter for them and then they glued on and coloured the other bits and pieces. Paul even wired up a couple of LEDs while we were doing this, so that Mr Dalek could have his own lit up "energy dispensers". 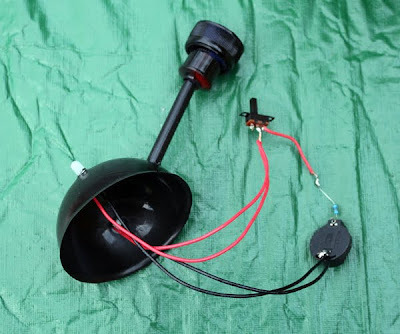 I have no idea if all this is the proper terminology for Dalek parts, but I found this link to reference, so that I wasn't always saying things like "sticky outy bit with a rubber plunger on the end" ;) Because we'd made the eyestalk with a stick of hot glue, we couldn't feed a third LED down it to make the light on the eyestalk, so I just hot glued a keyring light into the end of it instead. I love the fact that he's got the handle at the back of the juice bottle to pick him up by! We used some drywall shims to make the base. I don't know if anyone remembers that way back I got a packet of them and we made streamer dresses and roman centurion costumes with them, well, we still have quite a few left and they do come in handy! The gold vertical stripes are snapped up bits of wooden coffee stirrers. 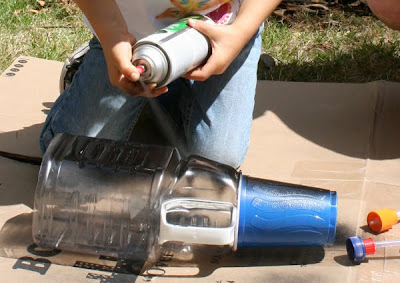 There are so many different types of Dalek that you can kind of wing it with the embelishments ;) This one has ended up looking a bit like the Dalek Supreme from the 1970s Planet of the Daleks, but that wasn't intentional, just what we happened to have in the recycling bin and the only two colours of spray paint we had. The kids decided his name was Julie, but then later changed their minds and said he was called Rovie. Here's a little video of him in action. He spins around and goes forwards but not backwards due to the limitations of the RC scooter that he's taped onto. 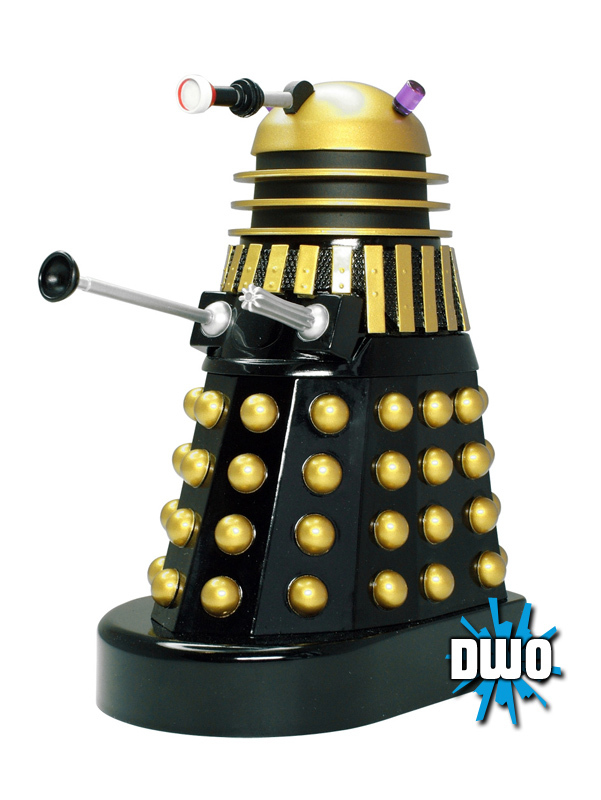 Admittedly he sounds nothing like a dalek. You can just about hear him saying "Vroom vroom! Whoohoo! Vroom vroom! Beep!" if you listen closely. Hee hee! We actually watched Star Wars "A New Hope" and "The Empire Strikes Back" for the first time over the weekend with the kids, and both were a HUGE hit with them. That might come as a surprise to those of you that saw us make balloon torch light sabers back in January, but actually only the boys I was looking after at the time had seen the movies and my girls were just happy to play along. I'm looking forward to next weekend when we can watch "Return of the Jedi" and see what they make of Ewoks :) Carys has already told me that we need to make R2D2 to go with Rovie the Dalek, so I'm not recycling our Electrosol dishwasher tablet container just yet! After Wall-e and now Rovie, I wonder what other classic robotic recyclables we can come up with. Johnny 5? Marvin? If your family isn't into Dr Who, that doesn't matter. You could make anything to go on top of an RC vehicle! Anything! Like a barbie pyramid formation? Remember this post from last month where I wrote at the end about the portrait the kids had drawn and painted of me? 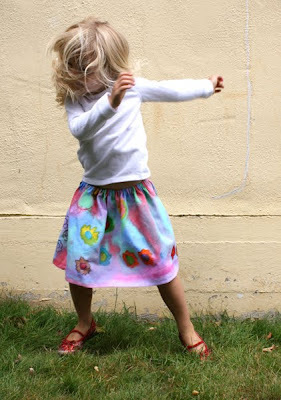 Remember the glorious colourful flowered skirt and how I really wished it was real? 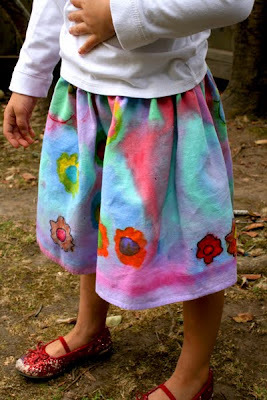 Well, I'd planned on letting the kids draw and paint their own skirts for a while but hadn't got around to it. Seeing that awesome explosion of colour gave me the push to sort it out for them. I know I wanted one for myself, but that'd be a lot of material to paint and I'm sure they would be much more excited about making one they could wear themselves. Another post some of you old timers around here might remember is way back when we made the dollar store dish towel skirts? 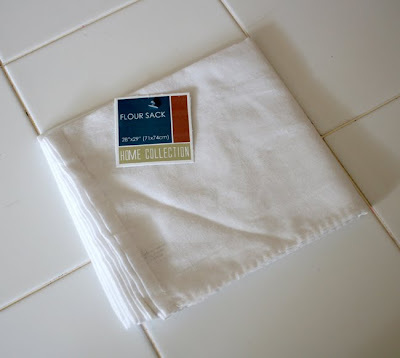 Those are still being worn and loved, so I figured we might as well make use of the plain white cotton "flour sack" tea towels/dish towels they are selling at the Dollar Tree at the moment. I washed one to get any factory chemicals out and get any shrinkage that was going to happen over with, then cut it in half and sewed the two parts together into a long strip. Then I taped it to the kitchen table with duct tape (If your table is nice and untrashed then you might want to protect it with something first). I left the bottom hemmed part untaped, so they could get the colouring and painting all the way to what was going to be the bottom hem of the skirt. 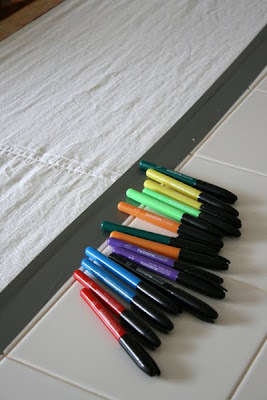 The dollar tree has also got sets of coloured permanent markers (non sharpie brand) in their back to school supplies, so I got a couple of packets of those for the kids to start drawing with. They drew a few flowers and coloured them in with the sharpies and while they were doing that I got out some of my acrylic craft paint and watered it down. 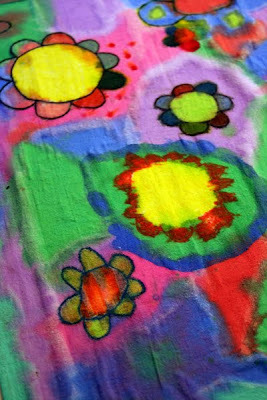 A good couple of years back we did some glue batik using watered down acrylic paint as the dye, here's that post. 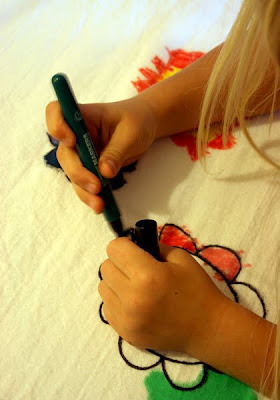 Of course you could totally do the glue batik for this project too, but I wanted something that they could do in one sitting, rather than having to wait for glue to dry and then come back to it. 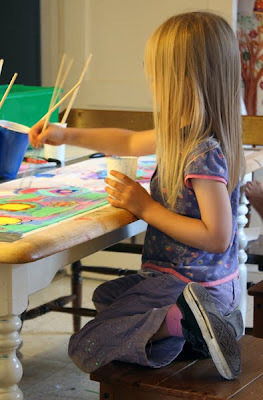 I gave them five colours of watered down acrylic paint in cups with brushes to have at the cloth with. They got very creative with it! 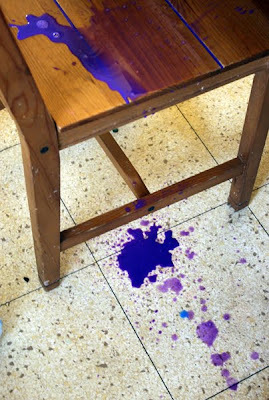 I have to warn you though that if you get this watered down acrylic paint on anything that you don't want it on, then wash it off right away because the stuff will not wash out when it's dried (that's the point of using it as cloth dye) My two managed to spill FIVE pots of the stuff! Seriously! Five pots! Anyway, cack-handedness aside, they did a fabulous job and covered the whole thing. 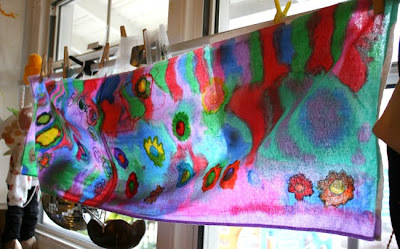 Here it is hung up at the kitchen window to dry. I let it dry very thoroughly before giving it a bloody hot ironing, to set the pen and paint as much as I could. Then laundered it and sewed up a hem all along the top. The colours stayed a lot more saturated than I thought they would, which was a pleasant surprise. I threaded elastic in the waist just like I did with the original tea towel skirts and it was all done. Here's my four year old modelling it. She's the most girly of the two. 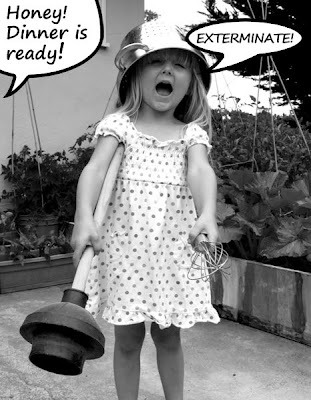 My older daughter is likely to request tea towel shorts rather than a skirt. Here's one of her rocking out, because you can see the gathered waist quite well. We'll be doing this again, and I'll probably be doing a few all on my own too, because it looked like a lot of fun! 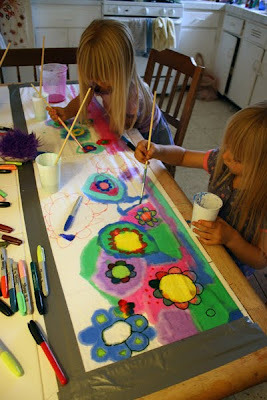 I'd love to make one covered in giant green leaves with watery looking sun flowers all over it! 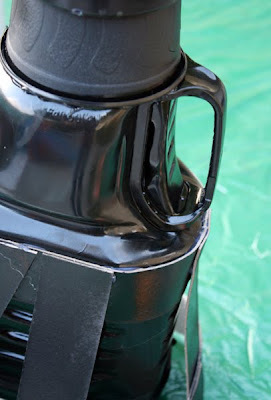 I also fancy one where only the bottom half is painted like a border, because the paint is watered down enough that it would bleed upward in a really cool way, but leave the very top white. I really like the way the watered down acrylics work, because you get more control than just painting with dye and you don't get that gross stiff fabric feeling that most fabric paints give you. 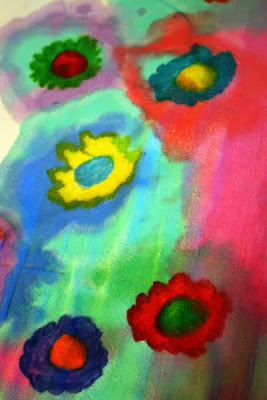 I was wondering how well the colours would set from painting on concentrated kool aid rather than the acrylic paint too. You could easily do other clothing like tshirts if you want to go for the full on Haight Ashbury look. Sorry, no ladybug roadkill yet ;) I was going to start on it last night and then realised that if I took photos for you in progress they would be all dark and dingy at night time and also I am not OK with making my daughter a replica of the Pillow Pet version because it's a ladybug with only four legs! Pulling legs off insects is not cool people! 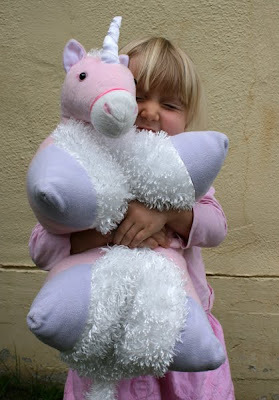 Have any of you had to deal with your kids begging you for a "pillow pet"? It's my own fault really. I let them watch I think it was Nick Jr and so they were bombarded with the advert more than a couple of times. 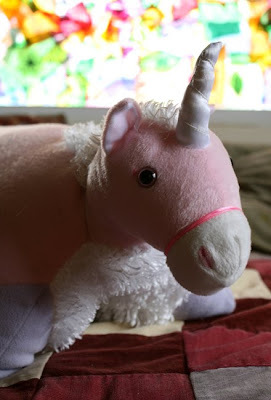 My kids are pretty good with not asking for stuff from stores or stuff they see in adverts, but for some reason the Pillow Pet thing has been a fairly constant desire. We happened to walk past a store that had them in the window yesterday and the kids went batty. The store was shut though, so we had some time to try and persuade them that they wanted a home made version instead. I wasn't best keen on the idea of spending over fifty bucks for two of the things. 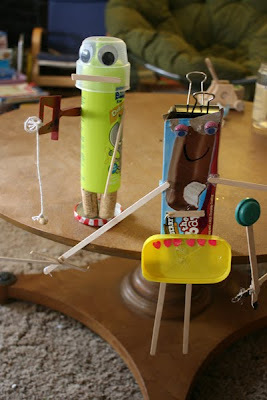 We talked about the possibility of making them, but the kids were extremely unimpressed with that idea. 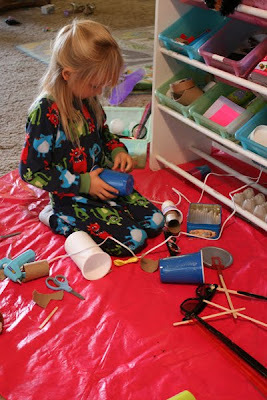 I figured that it was because they couldn't imagine well enough how we would make them and knowing their mum as well as they do, they probably assumed I was going to try and make them out of stuff in the recycling bin and hot glue. So, they went to bed and I dug around to see what we had that might work. Ffion was hell bent on a unicorn one and Carys wanted a ladybug one. A few months ago we got a couple of hobby horse things from the Dollar Tree. 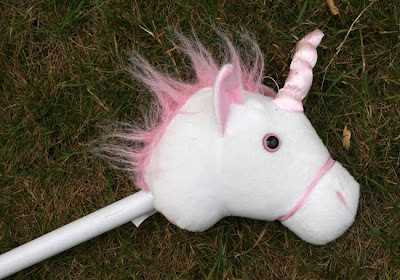 They were just soft toy unicorn heads glued onto a plastic pole. Well, things being what they are at our place, a bazillion children marauding around, one ended up fairly trampled with it's head off. 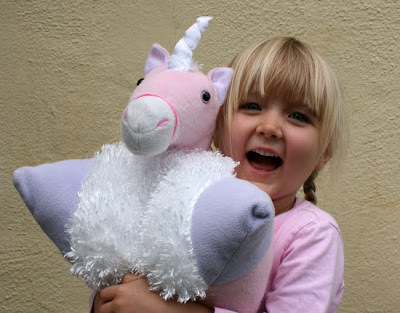 Now unless you have deep family connections with the Italian mafia, there's no real reason to allow your children to play with severed horses heads, so I figured why not use this as a starting point for the unicorn pillow that Ffi was after. Here's a pic of the non mutilated one, so you know what I'm talking about. I think they have also had normal non magical, plain old horse versions at the dollar tree too. I didn't take any pictures of this in progress, because honestly I didn't think it would work! Sorry about that! You can tell pretty easily from the pictures how he was put together though. I used a few scraps of spare fleece I had from making baby clothes. Some pink and some lilac. 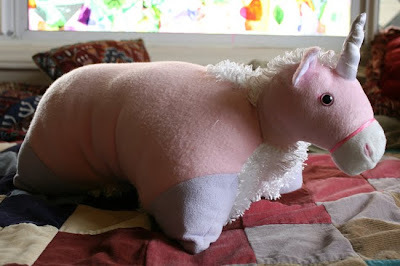 I was lucky enough that the pink of the dollar store horse head pretty much matched the fleece I had. I didn't have enough of the pink to make both sides of the pillow, so I used some of this weird kind of hairy white fabric that I had been using to make Owl babies (you know the book?). So, that's why the unicorn has such a bizzare furry undercarriage. LiEr over at Ikatbag just posted about some lovely bathrobes she made for her kids and said that terry cloth sheds more than any other fabric around, but I tell you girly, I'll take your terry cloth and raise you whatever this weirdo stuff is, because my livingroom looks like I've shaved Santa from head to toe, with him putting up a good fight. I also made the unicorn main and tail from that white furry stuff. 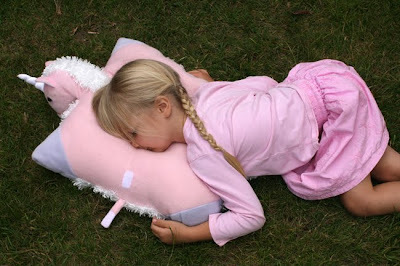 I took off the gross matted neon pink main and sewed in a longer one made of the fluffy white material, so that it would reach part way down the back of the pillow too. 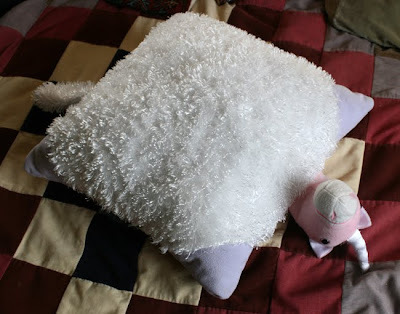 Once I'd sewn the lilac corners on both the sides of the pillows, to make the hoof-ish feet, I sewed in the head and tail and then a loop and tag for folding it up while the whole thing was still inside out. I left a gap on his side to turn him out and stuff him, then I finally popped a bit of velcro to keep the tag closed. All this was hand sewn last night and this morning, but if you were using a machine then it'd take you no time at all. Ffion was utterly unconvinced when she saw me sewing it this morning. She said it looked all funny and floppy and she still wanted to buy a "real one", but that was because it was still inside out and had no stuffing in it yet! I refused to give up and kept sewing until it was complete, and lo and behold, her opinion completely changed. "I LOVE HIM!!! IS HE ALL MINE?!!! HE'S SO FLUFFY!!!" 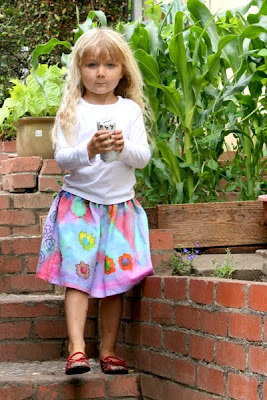 (She's basically like a blonde version of that unicorn obsessed kid in Despicable Me). ...and when you open him out? Well, all I can think is "Oh no honey! Stop the car! I think we hit a unicorn!" Kids love it though and it was all made from stuff that was already in the house, so now my next job is to make a ladybug one out of red and black felted cashmere sweaters I got from Goodwill when they were having their $2 sale. You want to see the ladybug when it's done or is the freakshow shetland roadkill unicorn going to give you enough nightmares as it is?